Unique in our mission and connections, we have served the South Bay community and Downtown L.A.’s Orthopaedic Institute for Children (OIC) for over 60 years. We volunteer at kids’ camps, schools, OIC, its clinic in Calexico and much more. We produce the Evergreen Ball and Fashion Show to celebrate our Senior families and fundraise for OIC. Discover a unique Mother-Daughter experience that develops meaningful connections. Recruitment goes on throughout the year. Please contact us! We are always here to answer your questions or meet for a quick chat so that you can learn more about our unique Mother-Daughter experience. Our enrollment period is in the Spring, but we invite prospective Las Ninas and Las Madrecitas to attend our events throughout the year, so that you may get to know us and we may get to know you. We have frequent speakers from OIC and fun social events, which will help you determine whether you’d like to apply for membership. By the time our Senior Las Niñas graduate, they have completed a minimum of 100 hospital hours and 200 community service hours each. Many Las Ninas are awarded the Silver Heart, which honors 500 hours of service. If you are an 8th, 9th or 10th grade girl with an interest in service, leadership, and teamwork, we are looking for you! Your Las Niñas class is forming; and the bonds you will make with your new friends will be forever. The Las Niñas Experience of positivity and generosity of spirit is life-giving. 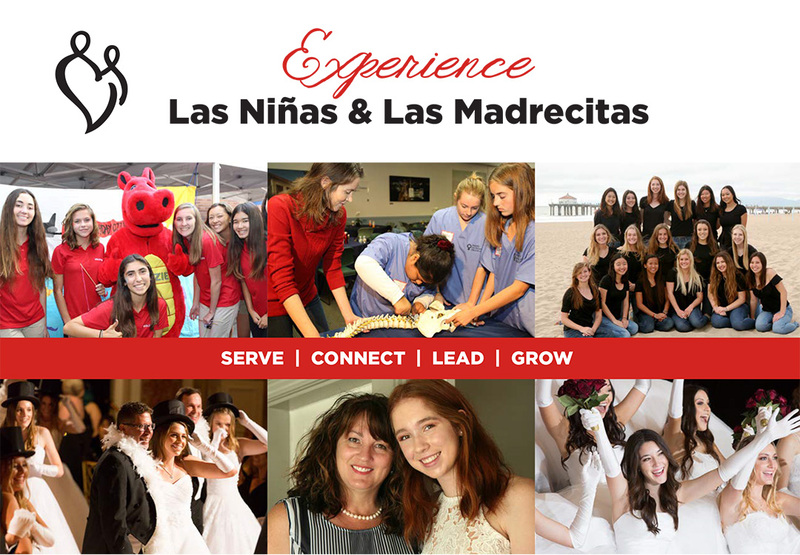 Ask any of the women in Las Madrecitas, and she will say, “Las Mads” will provide time for you and your High School daughter to be together in a meaningful way. Even dads express their appreciation. Senior year they spend hours waltzing with their daughters, to prepare for Evergreen Ball’s grand finale: the Father-Daughter Waltz. We strike a fun balance. Our members are kind and dedicated women who share a sincere desire to create a positive, caring environment. Volunteerism, philanthropy, and the magic of OIC deepen the bonds between us and our daughters, and one another.